Stanley Ball bearing hinges are designed to handle the extra stress brought on by high traffic doorways. The greased bearings reduce the rotational friction extending the life of a hinge in heavy use situations. 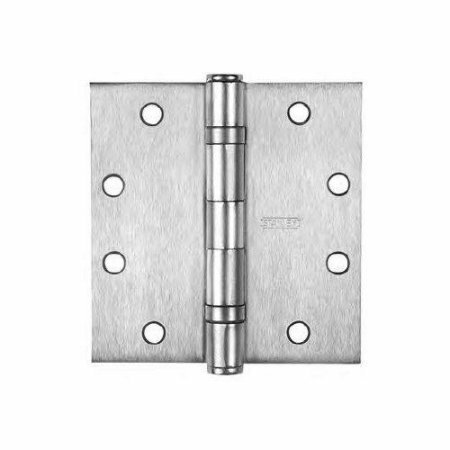 These hinges tend to be more durable than standard, or plain bearing hinges. Stainless steel reacts with oxygen in the air to form a very thin film of chromium oxide on the surface of the steel. This helps prevent the steel inside from rusting, and is great for homes in climates prone to rusting. For medium or heavy weigh doors,Can be installed on right Hand or left-Handed doors measuring 4' X 8' and up to 180 LB. Reversible flush pins and tips. Good for exterior doors, will not get Rusted. Equipped with two Stanley permanently lubricated non-detachable stainless steel bearings. Packed with # 12 wood Screws And #12-24 Machine Screws for metal Doors. View More In Door Hinges. If you have any questions about this product by Stanley Hardware, contact us by completing and submitting the form below. If you are looking for a specif part number, please include it with your message. Offset Pivot Hinge, Half Surface, 125 lb.